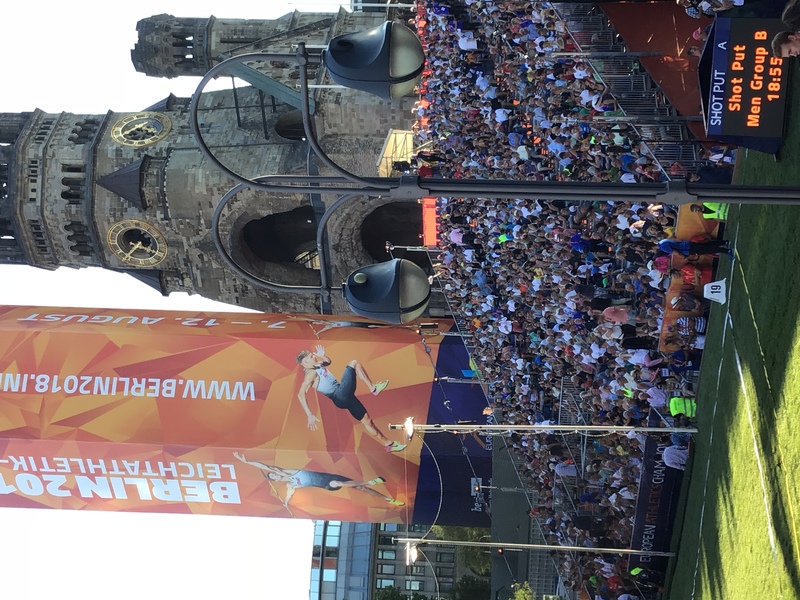 Call it what you want, but if you are a fan of the shot put, what took place in the shadow of the Kaiser Wilhelm Memorial Church in the heart of Berlin today was pretty close to perfect. Especially when you consider that this spot, known as Breitscheidplatz, was the site of a terrorist attack in the winter of 2016. Typical of such incidents, the attack was meant to destroy Breitscheidplatz as a thriving public place (the attacker struck during a popular Christmas market). Part of the German response to that effort was to wedge a world class shot put competition into the narrow confines of the Platz. 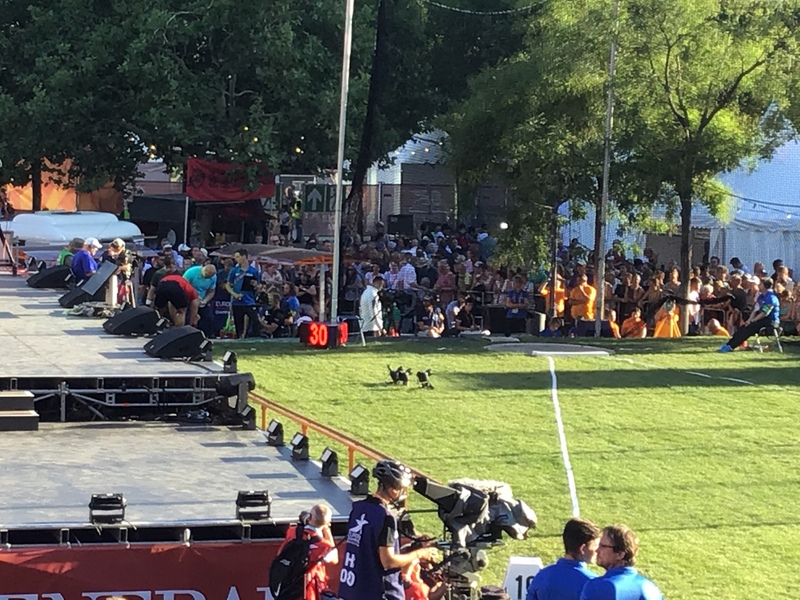 They built a wooden platform approximately four feet high, covered it with turf, erected some temporary bleachers, and invited people to come and watch for free. And come they did. The atmosphere (and I mean this as a compliment) reminded me of a high school football game on a warm September evening in a small town in the United States. People cheered and chanted and dressed in semi-ridiculous outfits. An entire section wore matching red hats and lime green t-shirts. There was an endearingly lame pep band. There was recorded music (everything from Michael Jacksons’s “Don’t Stop Till You Get Enough” which elicited a 19.54m toss from Luxembourg’s Bob Bertemes, to Billy Squier’s “Slowly Stroke Me” which greeted Bosnia and Herzegovina’s Kemal Mesic as he walked into the ring for his third throw sitting on two fouls. He went 18.70m and missed the final). There were large video screens. The one that I was facing showed a slo-mo replay of every…single…throw. There was drama. 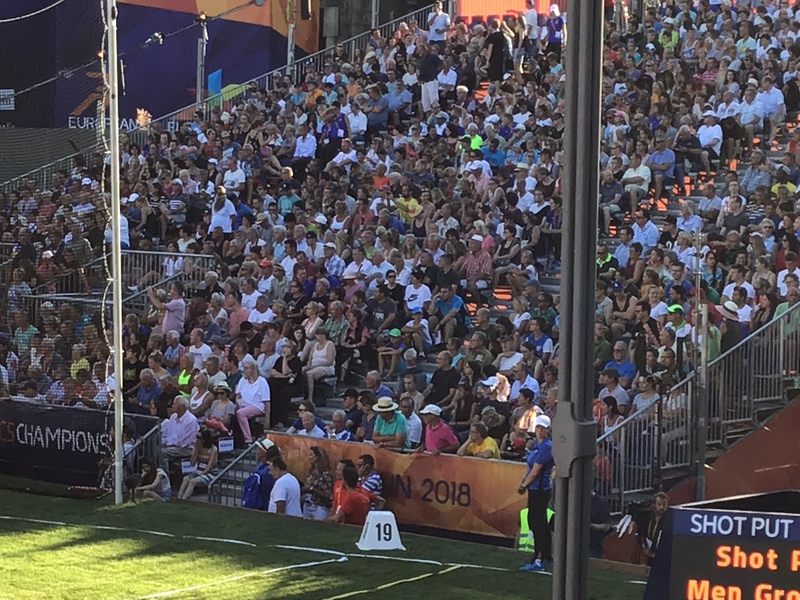 In round three, Bosnia and Herzegovina’s Mesud Pezer dropped one right at the automatic qualifying line of 20.40m only to have his effort nullified as a foul. He protested, and as the officials discussed the matter, the crowd was treated to several slo-motion replays of the throw, which caused them to boo lustily when it appeared that Pezer had commited no obvious infraction. It seems that he was called for the phantom right heel on the toeboard on his reverse, similar to what happened to Joe Kovacs in last year’s World Championships. This time, however, reason prevailed and the call was overturned. Pezer’s throw turned out to be 20.16m, enough to secure him a spot in the final. There was big time homerism. 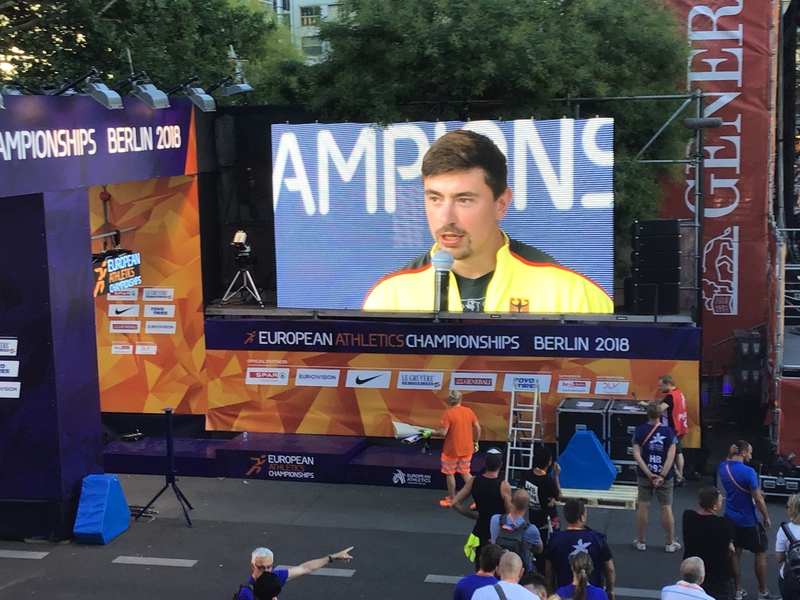 Homegrown favorite David Storl received an ovation for warming up (two fixed-feet glides, one around 19.00m and another around 20.60m), for being introduced, and for hitting an automatic qualifier of 20.63m on his first attempt (he reversed on that one). As round two ended for Storl’s group, the competition was briefly halted while the MC for the night interviewed David. I ‘m not sure that was totally fair to those in the field who were still hoping to hit a qualifying mark, but the crowd loved it. And that’s the thing. The crowd was active and happy and alive throughout the entire competition. How often can you say that about any track and field preliminary? One thrower who thrived on the atmosphere was Nick Scarvelis, representing Greece. I was curious as to where the throwers took most of their warmup attempts, as they seemed to be allowed only two on site. Had they warmed up at the Olympic Stadium practice facility before traveling to the Platz? Two others who prospered were Craoatia’s Stipe Zürich, the bronze medalist in last year’s World Championships, and Poland’s Michael Haratyk, the silver medalist from the 2016 European Championships in Amersterdam. Each surpassed the automatic qualifying mark on his first attempt, and they are the two most likely to give Storl some trouble as he strives to notch his fourth European Championships title. The final will take place inside the Olympic Stadium on Tuesday night, and though there might well be 50,000 fans going nuts for Storl, I don’t know if the atmosphere there or anywhere else can match what the Germans created tonight. At one point during the competition, the bells of the Kaiser Wilhelm Church rang out. I won’t say they were heralding a German shot put renaissance, a return of David Storl to his top form. There was something more to that sound. A little defiance maybe, and a lot of joy over thousands of people coming together on a warm Berlin night to…well…to have fun.